← Who writes these directions? Who Killed the Family Business? In 2015, Centre Club Business Connection Committee (the committee in which I currently serve as chair) needed an event: something theatrical. My recommendation was that to make it truly effective, it needed to be more than actors speaking to a passive audience. It needed to be totally interactive. This year, we’re producing still another all new production entitled “Who Killed the Family Business?” If you know anything about family businesses (and even if you don’t) you’re in for a real treat. Plan to join us on Friday, September 22, 2017. By the way, the production isn’t scripted. The cast uses improv to work our way through the scenes. We never know exactly what will happen. One thing is for sure, If you pay attention, you’ll be able to determine who is pulling the rug out from underneath the family and the family business! 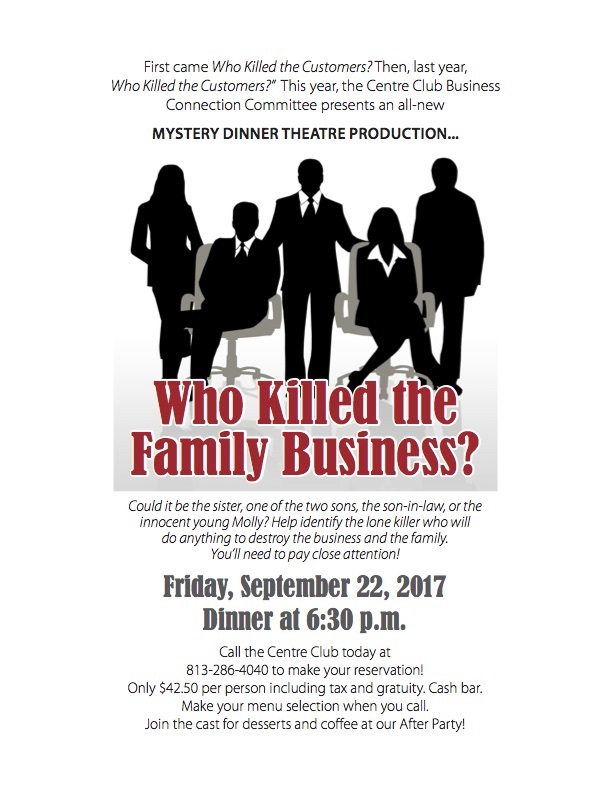 This entry was posted in Marketing and tagged mystery dinner theatre. Bookmark the permalink.